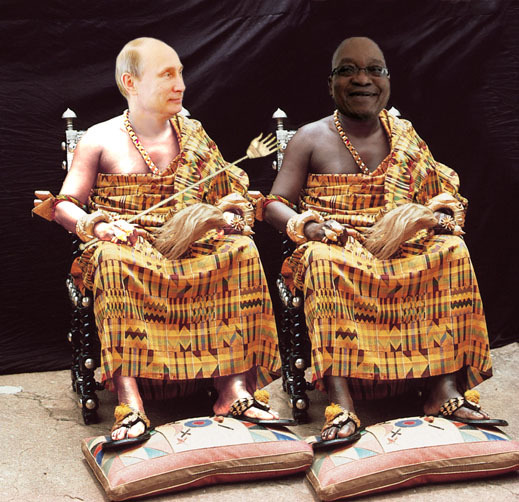 There has been no movement in Evraz’s proposed sale of its South African unit, Highveld Steel & Vanadium, to Nemascore, a special purpose vehicle created in February by a black empowerment enterprise linked to South Africa’s President Jacob Zuma (right). The deal for $320 million was announced by Evraz in March. At the time, the transaction was reportedly to be financed by Russian state bank VTB at a price which was more than double the market value of Evraz’s 85% stake in the company. Subsequently, the Industrial Development Corporation (IDC), the SA Government’s business stakeholder, said it was not involved in providing VTB with repayment guarantees to facilitate financing for Nemascore’s purchase. Neamscore’s directors have refused to discuss the deal, say where the money is coming from, or explain it in light of Highveld’s lossmaking and other troubles last year. Asked to clarify what has happened to the steel asset sale, Tatyana Drachuk, spokesman for Evraz, says: “We can confirm that the status of the transaction has not been changed since our last announcement.” In its March announcement Evraz indicated the deadline for finalizing the sale to Nemascore is June 30. On Monday Highveld issued unaudited results for the first quarter ending March 31, showing a significant recovery since the December quarter. Crude steel production rose 6% to 175,397 tonnes; rolled products volume was unchanged at 123,774t. Steel sales in the quarter jumped 21% to 135,512t. Despite a retreat in steel prices, Highveld reports a net profit of Rand50 million ($5.2m) for the quarter compared to a loss last quarter of R222m ($23.2m). The improvement lifted the price of the free-floating 15% of Highveld shares on the Johannesburg Stock Exchange. Still, this morning’s market capitalization of the company is the equivalent of $154 million, making the Evraz stake worth just $131.1 million – 15% more than it was when the deal was announced, but still well short of the deal price.